We’d love your help. Let us know what’s wrong with this preview of The Wild Birds by Emily Strelow. Cast adrift in 1870s San Francisco after the death of her mother, a girl named Olive disguises herself as a boy and works as a lighthouse keeper’s assistant on the Farallon Islands to escape the dangers of a world unkind to young women. In 1941, nomad Victor scours the Sierras searching for refuge from a home to which he never belonged. And in the present day, precocious f Cast adrift in 1870s San Francisco after the death of her mother, a girl named Olive disguises herself as a boy and works as a lighthouse keeper’s assistant on the Farallon Islands to escape the dangers of a world unkind to young women. In 1941, nomad Victor scours the Sierras searching for refuge from a home to which he never belonged. And in the present day, precocious fifteen year-old Lily struggles, despite her willfulness, to find a place for herself amongst the small town attitudes of Burning Hills, Oregon. Living alone with her hardscrabble mother Alice doesn’t help—though their unique relationship to the natural world ties them together, Alice keeps an awful secret from her daughter, one that threatens to ignite the tension growing between them. To ask other readers questions about The Wild Birds, please sign up. This novel is a collection of stories that are all connected by a silver box that holds egg shells from birds. The box is held by many people during its’ century-long journey. One holder is Olive who was given the box in 1870 while her mother was ill. After her death, she travels to San Francisco to live with her aunt. When she arrives her aunt can't be found and she needs to raise funds to live. She disguises herself as a boy for safety and to avoid undesirable choices for young women. She soon This novel is a collection of stories that are all connected by a silver box that holds egg shells from birds. The box is held by many people during its’ century-long journey. One holder is Olive who was given the box in 1870 while her mother was ill. After her death, she travels to San Francisco to live with her aunt. When she arrives her aunt can't be found and she needs to raise funds to live. She disguises herself as a boy for safety and to avoid undesirable choices for young women. She soon finds work as a male at a lighthouse on the Farallon Islands. A central part of the series takes place in modern times and details the complex mother-daughter relationship between Lily and Alice. Lily is fifteen and is upset that her mother will not disclose information about her biological father despite her constant pleading. At the same time, Lily grows tired of her mother's bad choice of boyfriends and resents her constant drinking. To avoid the fighting she decides to break away from her mother for a few months. Alice continues to move through various relationships until one of her friends gifts her a beautiful silver box. The Wild Birds weaves together various characters and stories over time. They are all interesting and it's fun to watch the connections evolve. This beautifully written novel is a debut by Emily Strelow and I look forward to more works from this author. The premise for this story set my imagination reeling even before reading it: mystery and intrigue, a mother and daughter tied together through their relationship with the natural world, a secret that tears them apart. What’s not to love? This debut novel that spans the landscapes of the northwest in the 1870s and generations of a family struggling to find where they belong is both a page-turner and an evocative meditation on relationships. At it’s core, it’s about how to find one’s home in the The premise for this story set my imagination reeling even before reading it: mystery and intrigue, a mother and daughter tied together through their relationship with the natural world, a secret that tears them apart. What’s not to love? This debut novel that spans the landscapes of the northwest in the 1870s and generations of a family struggling to find where they belong is both a page-turner and an evocative meditation on relationships. At it’s core, it’s about how to find one’s home in the world and in yourself. I was lucky enough to receive an advance e-galley of The Wild Birds. From the first paragraph of this confident, spellbinding novel—which opens from the point of view of a soaring hawk—I felt I was in good hands. The Wild Birds did not disappoint. Strelow's large cast of characters is separated by decades: a mother and daughter in present-day Oregon, a girl disguising herself as a boy, As You Like It-style, in a 19th-century Farallon Islands lighthouse, a mysterious man in the WWII-era Sierra Neva I was lucky enough to receive an advance e-galley of The Wild Birds. Strelow's large cast of characters is separated by decades: a mother and daughter in present-day Oregon, a girl disguising herself as a boy, As You Like It-style, in a 19th-century Farallon Islands lighthouse, a mysterious man in the WWII-era Sierra Nevada mountains. Like the hawk in the opening lines, they are all hunting, and inextricably bound to the natural world (and each other). I especially enjoyed the relationship between young Lily and her secretive mother, Alice. Alice is both tender and exasperating; to say more would rob the reader of one of the book's many pleasures. Strelow's intimate nature prose reminded me at times of the late, beloved Brian Doyle, another writer who managed to perfectly capture the glistening beauty of the Northwest. A deep, delicious dip into the untamed world and the lives of those who love it. The Wild Birds refer to the avian creatures that have been the symbols of freedom to humans for so long, but it can also be read as a tribute to myriad characters who find epiphany in their natural landscapes. This book is a love song, tender and fierce all at once. 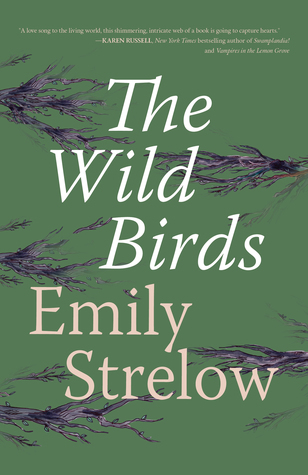 ‘The Wild Birds’ is the debut novel by American author, Emily Strelow. The book comprises three diverse stories, delivered in interspersed chapters, spanning over a century and loosely bound together by the acquisition of a silver box of eggshells. Each story is written in the third person from the perspectives of several of the main characters. The author has taken great care to set her scenes. She has a real affinity with flora, fauna and the environment; such that I almost felt like I should be listening to Ralph Vaughan Williams in the background as I read about the Northern Harrier hanging in the air over a thin patchwork of forest. Through imagery and symbolism, I was taken on a colourful journey from the small town of Burning Woods in the northwest coastal state of Oregon down through the Farallon Islands, to the arid Mojave Desert in California and on to the Sonoran Desert, spanning parts of California, Arizona and Mexico. I very much liked the story of Olive, set in the 1870s. The descriptive passages were very vivid and the idea of a sixteen year old girl passing herself off as a boy really grabbed my imagination. The pathos of Olive’s story is fascinating and I would have been happy if the whole book had been devoted to exploring her life in more depth. The contemporary family dynamic between Alice and Lily can be understood when the reader is taken into Alice’s confidence regarding Lily’s natural father. Undoubtedly much of Alice’s adult life and the choices she makes have been shaped by events from her past. The relationship between mother and daughter is tense at times with unpalatable truths bubbling just beneath the surface. The author’s message is clearly one of survival – protecting nature and protecting loved ones. She also explores complex human emotions and interactions as each of her multi-layered stories develop. Historical fiction plus nature (and a lighthouse!) -- yes please! ***This review is a work in progress. Thank you, first, to Suzanne Leopold, who had two copies of this book to offer. I was lucky enough to be one of the readers selected. What a wonderful book. I loved every word. The symbolism of the wild birds is haunting. There are five characters to discuss.. all of them complex and worth understanding. This book is about connectivity, after all. When completed, this review will show that connectivity, without spoilers. That is my challenge right now... doing ***This review is a work in progress. There are five characters to discuss.. all of them complex and worth understanding. This book is about connectivity, after all. When completed, this review will show that connectivity, without spoilers. That is my challenge right now... doing this book justice without spoiling the read for anybody. Emily Strelow’s novel The Wild Birds is an mesmerizing debut. She deftly weaves a diverse cast of characters and three time frames into a cohesive whole, a mosaic glittering in the sunlight. Olive, an orphan who disguises herself as a boy and becomes a lighthouse keeper’s assistant on the Farallon Islands in the 1870s. Victor, the runaway son of a wealthy parents, searches for a place in which he can find himself and to call home in the 1940s. Finally, in the present day, Alice and Lily, a mothe Emily Strelow’s novel The Wild Birds is an mesmerizing debut. She deftly weaves a diverse cast of characters and three time frames into a cohesive whole, a mosaic glittering in the sunlight. Olive, an orphan who disguises herself as a boy and becomes a lighthouse keeper’s assistant on the Farallon Islands in the 1870s. Victor, the runaway son of a wealthy parents, searches for a place in which he can find himself and to call home in the 1940s. Finally, in the present day, Alice and Lily, a mother and daughter are tied by their unique relationship to each other and to the family’s filbert farm. Alice loves Sal, another woman, and eventually leaves her daughter to find her true love. Tying all these lives together is a lovely spandrel—a silver box with partitions to hold egg shells. With some of the best nature prose I’ve read, Strelow reveals the intimacy and the grandeur of the Pacific Northwest, an experience akin to being in an Ansel Adams landscape. There is an underlying thread of abuse of the land bringing to mind an understated Rachel Carson. Her knowledge and love of birding is apparent and her ability to transport readers to forests and deserts is unparalleled. Three timelines expertly told in the setting of the Pacific Northwest with gorgeous descriptions of nature and birds. I was drawn in from the first paragraph and never set the book down until I finished, with great regret. I only wish I could write nature with such talent and passion. Reminded me of Barbara Kingsolver. As I finished the book, I immediately began to plan my trip to the Pacific Northwest. If you’ve ever been to Oregon, you know there’s a certain type of vibe or free-ness. It thrives on its beautiful nature and wildlife. This book reads like a visit to Oregon and follows a crystal container holding an assortment of hollowed eggs as it passes through the hands of people starting in the late 1800s to the 1990s. I learned a bit about the history of Oregon and enjoyed the ride. i thought that this novel was going to be a group of loosely connected short stories. It isn't. It is essentially about a girl in California in the late 1800s and the connection between her and a mother and teenage daughter living in the Willamette Valley in Oregon in the 1990s, and the man from the mid-20th century who connects them. The connection here is represented in a box that contains birds' eggs. Alice and her daughter Lily lead somewhat troubled lives in Oregon, much revolving around Al i thought that this novel was going to be a group of loosely connected short stories. It isn't. It is essentially about a girl in California in the late 1800s and the connection between her and a mother and teenage daughter living in the Willamette Valley in Oregon in the 1990s, and the man from the mid-20th century who connects them. The connection here is represented in a box that contains birds' eggs. Alice and her daughter Lily lead somewhat troubled lives in Oregon, much revolving around Alice not being honest with Lily as to who her father is. Olive is a 16-year-old living in Colorado in the late 1880s whose mother dies. Olive leaves for San Francisco and gets a job, pretending to be a boy, on an island helping to run a lighthouse. The novel follows her story up until she dies and relates the significance of a particular collection of bird's eggs that she has. Victor is introduced, originally from Seattle, who ends up in Arizona and comes to possess such box of eggs. They end up in the hands of Sal, Alice's best friend. Mixed in with all this is quips about birds of many kinds, as well as the overall interconnectedness of nature. This is an extraordinarily told story. It is very well written and easy to follow. The prose, at times, is simply breathtaking. Emily Strelow is such a strong writer, poetic, compelling, emotionally strong, and able to subtly weave in her politics without being pedantic or intrusive. For example, she mentions a couple of times the fortune of women having a choice in the manner of pregnancy. Gorgeous, feminist, contemplative and an ode to the natural world, THE WILD BIRDS instantly brought me back to reading REFUGE by Terry Tempest Williams in college - a book that flashes through my mind on a surprisingly regular basis. THE WILD BIRDS is destined to occupy that same mind space going forward. I adored the cast of characters that Strelow chose to tell this story, as well as the lush settings. I mean, there were forests, deserts, an ocean and a LIGHTHOUSE for goodness sake ~ and the b Gorgeous, feminist, contemplative and an ode to the natural world, THE WILD BIRDS instantly brought me back to reading REFUGE by Terry Tempest Williams in college - a book that flashes through my mind on a surprisingly regular basis. THE WILD BIRDS is destined to occupy that same mind space going forward. I adored the cast of characters that Strelow chose to tell this story, as well as the lush settings. I mean, there were forests, deserts, an ocean and a LIGHTHOUSE for goodness sake ~ and the birds. The birds are everything. I cannot recommend this book highly enough to readers looking to slow down, connect with nature and think deeply about how we are all tied together on this wild and beautiful planet. A masterpiece historical-fiction that merges with nature and who else could write it better than Emily! I really enjoyed reading this fabulous book by my new favourite Author! It's very filled with nature description which makes the book so unique, Emily has created a very rare genre of books that makes you devour in a very great way the novel, her writings are very cute and interesting, I loved the book since I first read the synopsis but reading the lines within the novel was a great experienc A masterpiece historical-fiction that merges with nature and who else could write it better than Emily! I really enjoyed reading this fabulous book by my new favourite Author! It's very filled with nature description which makes the book so unique, Emily has created a very rare genre of books that makes you devour in a very great way the novel, her writings are very cute and interesting, I loved the book since I first read the synopsis but reading the lines within the novel was a great experience! The sorting of acts is very well connected and this has amazed me knowing that this is only a debut novel, so the story talks about Olive an orphan girl who has different adventures in life, some interesting and some very emotional, I really find the story of Alice very romantic and so unique, but also the novel talk about Alice and Lily from Oregon, and the story of Alice is very powerful and emotional that I highly recommend you to devour it, Strelow wrote about very detailed moving emotions that kept me going to turn pages! Terry Tempest Williams meets Annie Dillard in this lyrical story with overlapping connections to flora, fauna and family. Strelow weaves a thorough knowledge of natural history and her love affair with birds into every page. An ambitious literary debut from an evocative new voice. FIVE BRILLIANT STARS! This book appealed to me on so many levels. Firstly, the characters are vividly drawn, and oh so human. Their stories are intertwined across more than a century, tied together by a treasure trove, a silver velvet lined box containing a collection of bird eggs, such a symbol of potential and nature’s miracles, as most birds do not survive their first year. The female protagonists are varied, and I felt a connection with each one. Then we have the other stars of the book, th FIVE BRILLIANT STARS! This book appealed to me on so many levels. Firstly, the characters are vividly drawn, and oh so human. Their stories are intertwined across more than a century, tied together by a treasure trove, a silver velvet lined box containing a collection of bird eggs, such a symbol of potential and nature’s miracles, as most birds do not survive their first year. The female protagonists are varied, and I felt a connection with each one. THE WILD BIRDS, Emily Strelow's debut fiction/historical novel, was published March 13, 2018 by Rare Bird Books. Over a roughly 120-year span, the novel weaves together multiple overlapping stories about a diverse cast of characters who are all connected by an ornate silver box containing the egg shells of various birds. This is a novel about finding oneself and a place to call home. Olive was originally given the silver box by her mother before her mother died in the 1870s. Realizing that the li THE WILD BIRDS, Emily Strelow's debut fiction/historical novel, was published March 13, 2018 by Rare Bird Books. Over a roughly 120-year span, the novel weaves together multiple overlapping stories about a diverse cast of characters who are all connected by an ornate silver box containing the egg shells of various birds. This is a novel about finding oneself and a place to call home. Olive was originally given the silver box by her mother before her mother died in the 1870s. Realizing that the life of a female, teenage orphan offers very little opportunities, Olive disguises herself as a boy and finds work as a lighthouse keeper on the Farallon Islands west of San Francisco. There she meets Warren, a young man who works for one of the companies that raids the seabirds' nests for their eggs. Warren discovers that Olive is a girl, and together they flee the island for a life together in Northern California. Many years later, in the 1940s, a young man runs away from his family's home in Seattle. Victor is a tender man who loves music and poetry. When his father refuses to accept his 'sissy' son, Victor runs away to a life in the deserts of Arizona. Along the way, he meets Warren. Olive has since passed away, and Warren knows he will soon follow her. As a last act, Warren gifts Victor with the silver box of eggs. Victor then continues on his travels until he finds his home in Needles, Arizona. Victor holds on to the silver box for over forty years, waiting for the right person to come into his curio shop, Naked Antiques, for him to pass the box along to. Sal is that person. She is a transplant from Oregon. She moved to Arizona to attend college and to track various birds in the deserts during mating season. While on a brief stop in Needles to purchase supplies, Sal wanders into Naked Antiques and finds the silver box. Sal later sends the box to her friend, Alice, back in Oregon. Sal is in love with Alice, but she spends years fearing the consequences of expressing her love. At the center of the novel is the relationship between Alice and her daughter, Lily. Their story is set in the mid-1990s. Lily is fifteen years old, and she doesn't fit in with the other teenagers in the rural area of Oregon that she calls home. She also resents her mother because Alice runs around with different men and drinks a lot. Lily feels like she is the adult in their relationship. Lily is also convinced that there is something about her mysterious, absentee father that Alice isn't telling her. Unable to deal with her mother any longer, Lily goes to live with friends for a few months. When she finally returns home, she finds her mother gone. Alice has finally decided to follow her heart to Arizona in search of Sal. The flora and fauna of Arizona, Farallon Islands, and the Pacific Northwest plays a major role in THE WILD BIRDS. The landscape of these different locations is as diverse and unique as the characters. Birds are the most important and prevalent of the fauna featured in the novel. It is clear that Strelow knows a good deal about various birds. She is also familiar with the different types of flora native to the various locations featured in the novel. Each of the landscapes comes alive through Strelow's descriptions. THE WILD BIRDS is a beautifully written, captivating novel. Sweet comes to mind first. Fate, next. Hopefulness, thereafter. This is a beautifully written literary novel about how each person's life is connected to others, how the natural world interacts with people's lives, and so much more. I settled down and allowed myself to be enchanted by the words and images of the book, and was rocked into the author's wonderful, fierce world. You are going to love this book. The literary aspect is wonderful. And I enjoyed the four perspectives. But it plodded along and didn't do much for me. 3/5 stars. This is another novel, I'm not quite sure how to review. It almost reads like a series of short stories woven together by their connection to a chest of bird eggs. Primarily, there are two stories occurring--Olive's and Alice and Lily's. But it is also Sal's and Victor's. It is 1874 and Olive becomes orphaned when her mother dies. One of Olive's only treasures from her mother is the chest of bird eggs. She is a teenager with not many prospects other than prostitution. To save herself from that fa This is another novel, I'm not quite sure how to review. It is 1874 and Olive becomes orphaned when her mother dies. One of Olive's only treasures from her mother is the chest of bird eggs. She is a teenager with not many prospects other than prostitution. To save herself from that fate, she cuts her hair, binds her chest and goes to work as a lighthouse keeper on the Farallon islands. There she meets Warren, who saves her from being attacked by 3 eggers--men who take bird eggs from nest and then sell them on the mainland. Warren learns her secret and they plan an escape. They eventually move further inland and make a life for themselves. It is 1994 and Alice and Lily live on a filbert farm in Oregon. Alice is the typical hippie rebelling against her overly strict parents. She is raising her daughter Lily on the same piece of land that she was raised on. She is in possession of the bird eggs because her friend Sal found it in a shop in Needles, AZ and sent it to her. Alice thought she might be in love with Sal, but was raped at a party and became pregnant with Lily. The pacing of this book is gorgeous. The braided stories are unexpectedly subversive and punk rock despite floating above the world on a warm breeze. It is dusk in the American outdoors, tiny details that command your attention, the kind of book you could settle into like a camp chair. This is a well-wrought novel that satisfies on a number of levels, emotional and intellectual. I especially appreciate Strelow's historical ambition and the thoughtful way she engages with the intersections between the human and animal realms. She evokes her characters--male and female, contemporary and historical--with great insight and empathy. This is a gorgeous book. It's the perfect book for readers who love literary novels and birds, but others will love it too! Strelow's images are vivid, her language lush and haunting, her characters intriguing and well drawn. History buff that I am, I especially enjoyed the sections with young Olive dressed in boy's clothes! Highly recommended. This story is delightful. I was enraptured by the birds, nature and tales of engaging female characters. What a beautiful story of overcoming. I highly recommend. This book is beautifully written. The story is simple, but the depth of thought that Strelow puts into the pages of this book is provoking, and makes it a books that you hate to see end. Strelow's connection to the natural world is most evident.... and in our modern world these earth connections are rarer, indeed.